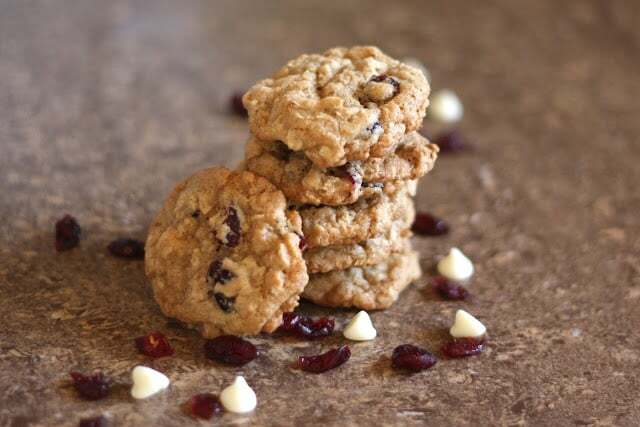 Dried cranberries, chocolate and old fashioned oats create one of my all-time favorite cookies. I owe my cousin, Hope, an enormous thank you for suggesting this flavor combination a couple years ago. This cookie was a hit from the first time I made it. This is my husband’s very favorite cookie. 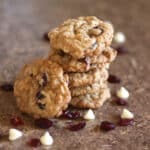 I’ve played with my oatmeal cookie recipe for the past few months trying to figure out a gluten free oatmeal cookie that compares to our traditional oatmeal cookie. These cookies are it. They are both crisp on the edges and chewy throughout the cookie. They have a lighter texture than the average oatmeal cookie, making it very easy to snack on them. Preheat oven to 350 degrees. In a large bowl, cream together the butter and the sugar, until smooth, about 3-4 minutes. Add the eggs and vanilla and beat until smooth again. In a separate bowl, whisk together all of the dry ingredients except the cranberries and chocolate. Gradually add this mixture to the wet ingredients, half at a time. Stir until fully combined. Add the cranberries and chocolate and stir well. 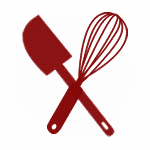 Using a medium size scoop or a rounded tablespoon, drop the dough onto a large baking sheet lined with a silpat mat. Bake for 8-12 minutes, depending on size. Remove from the oven before the cookies are lightly browned and when they still look soft in the center. Be careful not to over-bake. Let them cool on the same tray for 1-2 minutes; this will allow them to finish baking without overcooking. Store in an airtight container. Enjoy! It was a cookie weekend! These look lovely. I bet the cranberries really compliment the chocolate. Gluten free too - going in my pile of must try soon recipes! Mmm I love a good oatmeal cookie!! These look super chewy and yummy! 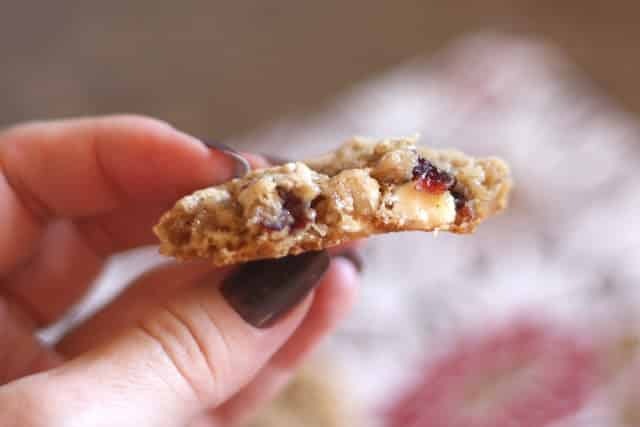 This sounds like a fantastic variation on the standard oatmeal cookie! Yum! White chocolate and oatmeal sounds so good to me. I don't love white chocolate all by itself, but it combines so well with other flavors. Looks like these cookies have a great texture too! This sounds like heaven to me…Love oatmeal cookies! I always make these for Christmas! Oh YUM!! Do you need my address to send me a care package? lol Seriously, though, I love this cookie recipe... will be making these soon for sure! This is my all-time favourite too! Mary, these look fabulous - what a wonderful combination of ingredients, can't believe they're gluten-free, very impressive! Oh my goodness these look so delicious!! What a great blend.